Home / Headlamp Shells All 7"
Plain steel shell, 7/16″ UNF bolt holes. 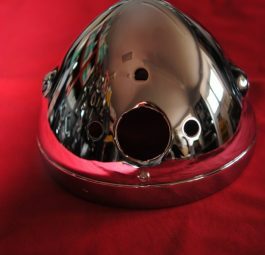 Lucas plain chrome shell, 3 harness entry holes, 7/16″ UNF bolt holes. 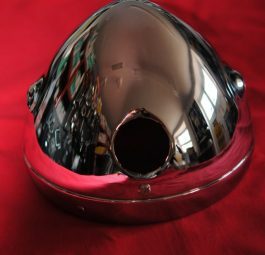 Triumph motorcycle, chrome head lamp shell with ammeter hole, ’60 – ’66 (also ’67 if hole is cut for light switch) 5/16″ UNF bolt holes. MADE IN ENGLAND. 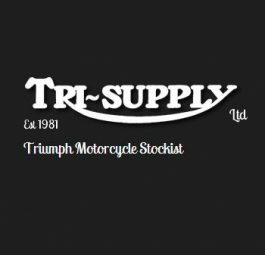 Triumph Motorcycle, Chrome head lamp shell with ammeter, switch and 2 warning light holes, 67 – 70, 5/16″ UNF holes . MADE IN ENGLAND. Nacelles – early to late in limited number – some genuine new old stock.